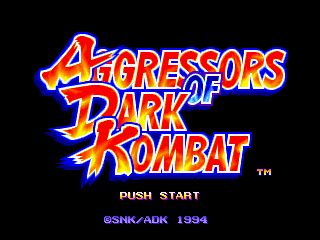 Aggressors of Dark Kombat, known in Japan as Tsuukai GANGAN Koushinkyoku (痛快GANGAN行進曲, lit. Thrilling Intense March) or simply GanGan (GANGAN is a Japanese onomatopoeia for the sound of a large bell or a scolding voice) is a 1994 one-on-one fighting arcade game developed by Alpha Denshi Corp. (ADK) and published by SNK. The English game title uses the same initials as the developer.